allround geek: Trailer for RUBBER, the greatest (and only) killer tire movie ever made! 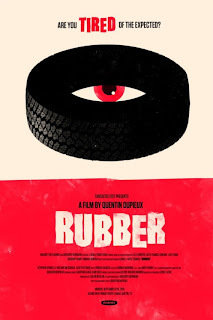 Trailer for RUBBER, the greatest (and only) killer tire movie ever made! Yes you read that right. A movie about a killer TIRE! A tire with telekinetic powers that kills people by exploding their heads. Just for the absurdity of this idea it merits a screening. And it also looks quite well made so it's not just some trashy movie. Have a look on the trailer below and never look at a tire the same way!